Place onions in a shallow but wide dish. Pour buttermilk over the onions and let sit for at least an hour. Mix together flour, salt, cayenne and black pepper in a similar shallow but wide dish. Heat oil in a heavy bottom pan to 375F. Using tongs, pick up a small amount of onions from buttermilk and dredge in flour. Shake off excess and drop (carefully!) into oil. Fry for several minutes until onions are golden brown. Place on paper towel and repeat steps with remaining onions. 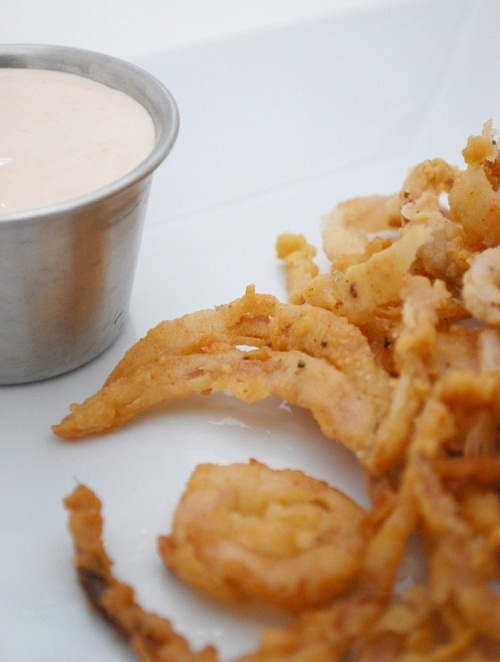 Mix all ingredients in a small bowl and serve with onion strings or as a burger sauce.